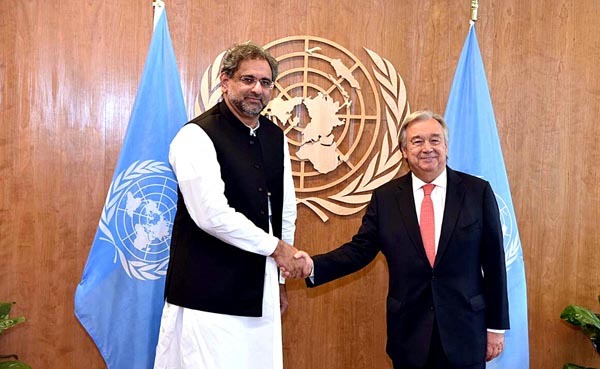 a 25-minute meeting with UN Secretary-General Antonio Guterres at the world body’s Headquarters in New York Thursday during which he discussed Kashmir and Afghanistan among a range of subjects. UN chief’s reform initiatives to make the organization more efficient and effective, and reaffirmed Pakistan;s commitment to UN peac-keeing. Pakistan is among the largest troop contributors to the UN peacekeeping operations around the world. documenting human rights violations in the Indian Occupied Jammu & Kashmir. had closed all the doors on any dialogue. settlement to bring lasting peace in Afghanistan. monitors the Line of Control.